The Telangana State Public Service Commission (TSPSC) is Published Horticulture officer (HO) Recruitment Notification 2018 in Horticulture Officer Under The Department of Agriculture And Cooperation, Telangana State. Applications are invited Online from qualified candidates through the proforma Application to be made available on Commission’s Website www.tspsc.gov.in to the post of Horticulture Officer under the Department of Agriculture and Cooperation. 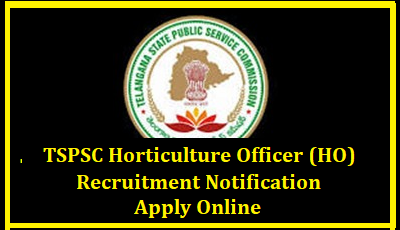 TSPSC Horticulture Officer Recruitment 2018 - 27 Horticulture Officer Posts in Commissioner of Horticuture: Telangana State Public Service Commission (TSPSC), Hyderabad issued TSPSC Horticulture Officer Recruitment 2018 Notification (Advt. No. 02/2018) for the recruitment of 27 Horticulture Officer posts in Commissioner of Horticulture, Telangana State. Eligible candidates can apply online through tspsc.gov.in from 29.01.2018 to 28.02.2018. Must possess a Degree in Horticulture of a recognized University or Institution recognized by the University Grants Commission. Provided that M.Sc. (Agriculture) with specialization in Horticulture would be considered for appointment if candidates having a degree in Horticulture are not available. Horticulture are not available, the candidates with B.Sc. Degree qualifications in Agriculture shall become eligible. Eligible candidates can apply online through tspsc.gov.in from 29.01.2018 to 28.02.2018. Candidates should complete the OTR process before applying online. Candidates required to pay Rs. 200/- towards Application Processing Fee and Rs. 120/- towards Examination Fee. SC/ ST/ BC/ Unemployed applicants, PwD, Ex-SM candidates are exempted from payment of Examination Fee. Selection will be made through Written Test and Interview.